Frequently asked questions about upgrading. EuroFront links EastFront and WestFront together into a complete simulation of World War 2 in Europe from 1936 to 1945 (including the Spanish Civil War). 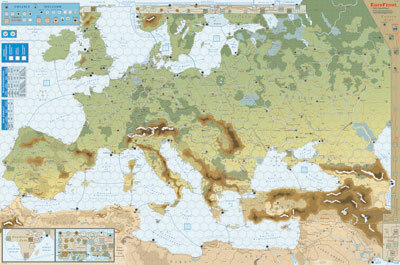 The game contains the EuroFront system rules and over 240 blocks for every European nation from Norway to Turkey. Axis and Allied versions are provided for most nations. Axis, Allied and Soviet units for the North and Mid-East fronts are also included. With the maps and blocks from EastFront and Westfront, you can now replay all of WW2 in a single weekend. The core rules for EuroFront have not changed. There are new diplomatic and alliance effects as well as new streamlined rules for exit zones. All edge of the map rules have been revised and simplified. Exit zones are no longer required. Bordering the map are Districts and Regions with connecting road or rail lines and links to the main map. Total playing area is 45" x 68". Ownership of EastFront and WestFront are required. The Axis consists of Germany and all powers allied with it. The Allies consist of all powers opposing the Axis except the Soviets. The Soviets also oppose the Axis, but remain distinct from the Allies. One player (or team) plays the Axis side, and the other player (or team) plays the Allied - Soviet side. Play begins with most powers being neutral. Neutrals do not belong to any faction. Except for the Soviets (whose units are always in play on the map), neutral units are not deployed on the map. Units cannot enter neutral territory: to do so, a Declaration of War must first be issued, converting the neutral into a belligerent. 1) A Declaration of War is made upon it, and it immediately joins the opposing faction. 2) It makes a successful Alliance Reaction in response to another neutral becoming belligerent. 3) A Diplomatic Event makes it become belligerent in response to the pressure of events or great power diplomacy. If a neutral becomes belligerent, the faction it joins gains control of its production, territory, and forces (which are then deployed on the map). Minor power forces are shown on the Pro-Axis / Pro-Allied Neutral OB cards according to the faction they usually join, although neutrals can join either side. Units are shown as of September 1939, but when entering play, they are built up to allow for Peacetime Production occurring since that date. The maps are divided into hexes (hexagons) to determine location and movement. Terrain features include rivers, forests, mountains, cities,and railways. Terrain affects both hexes and hexsides. Wooden blocks (called units) represent Axis, Allied, and Soviet forces. Axis blocks are black, and represent German corps or Italian /minor power armies. Allied blocks are blue, and represent British/US corps or French /minor power armies. Soviet blocks are red, representing armies. Attach an adhesive label showing unit-type, nationality and strength to each block. Units in play normally stand upright, with their labels facing the owning player, to prevent players from seeing the type or strength of opposing units (fog of war). The type of unit (armor, etc.) is shown by the symbol in the middle of each label. Unit types have defined movement and combat factors, so these are not shown on the label. Special units called Headquarters(HQs) control other friendly units. Large numbers around the unit symbol on the label indicate the unit's strength or combat value ("cv"). The current cv of a unit is the number shown upright along its top edge when standing upright. EuroFront is divided into fronts (East Front, West Front, NorthFront, and Med Front) for Production and Weather purposes. Special rules apply to the Med Front and North Front. Note: these fronts are denoted in these rules by two italic words (East Front), while the game of the same name is denoted by one bold word (EastFront). In general, combat units can move freely between fronts, but lose cv when entering extreme fronts (NF/MF). HQs are penalized for activating outside their "home" fronts. Production is allocated between the fronts every six months. Sending production to a front in excess of these allocations is possible, but costly. 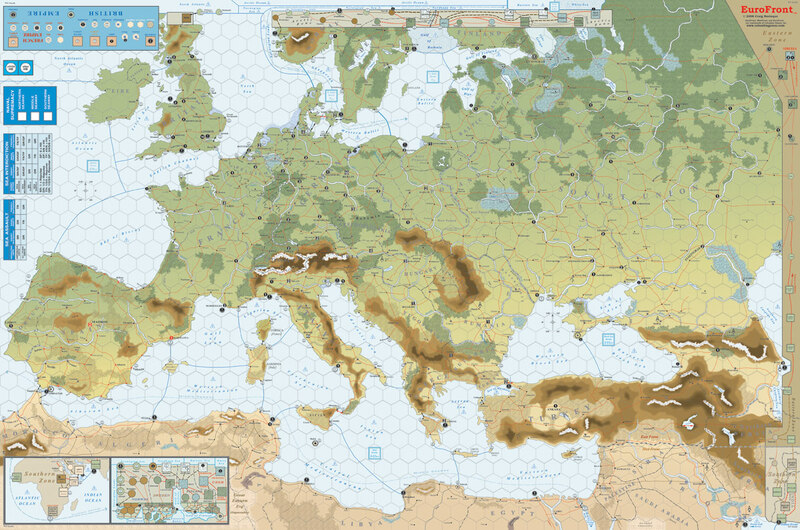 EuroFront is divided into scenarios, one beginning in each summer of the war. All scenario games end in June 1945, when Victory is determined. A game Month consists of Production and Diplomacy phases followed by two Fortnights of play. Production awards Production Points (PPs) based on control of cities and resources, which are then spent to rebuild eliminated units or add cv to depleted units in play. Both sides do Production simultaneously. Diplomacy gives each side a chance for a favorable event to occur. A Fortnight consists of one Player-Turn for each player. The current player is the Active Player and the opponent is the Passive Player. Weather (Dry, Snow or Mud) applies for a fortnight to an entire front, and can be either fixed or variable (die roll), depending on the game-Month. Mud and Snow hamper operations. Player-Turns consist of distinct phases taken in order by the Active Player (Command, Movement, Combat, Supply, and Politics). During the Command phase, players activate friendly HQs in order to command movement and provide combat support for friendly units within Command Range (equal to HQ CV). Declarations of War are made at the beginning of this phase. Only units commanded by an activated HQ can move. Units can move a maximum distance according to their unit type. This distance can be modified by terrain and weather. Units must stop upon entering a hex that contains enemy units. Only Supreme HQs (SHQs) can command units to move strategically by sea or rail. Combat occurs when opposing units occupy the same hex. Units in combat are revealed to the opponent. Combat is resolved by exchange of fire between opposing units.Following a possible attacker airstrike (one per battle maximum),passive units fire first, then active units. Battles continue from turn to turn (often for months) until one side is destroyed or voluntarily retreats. Passive (defending) units benefit from reduced combat losses (e.g., double defense) in adverse terrain(mountains, forests, etc. ), or when combat is unsupported by a nearby activated enemy HQ. Active (attacking) units always apply full losses (never reduced). Units unable to trace a Supply Line to a Supply Source lose one cv per turn, a severe penalty. Supply Sources are usually rail lines connecting to that faction's Supply Origin (normally its Great Power capital). Sea Lanes between ports connect friendly rail lines. Political Events such as Defeat, Surrender, and Demoralization can occur during the Politics phase at the end of the Active Player's turn.